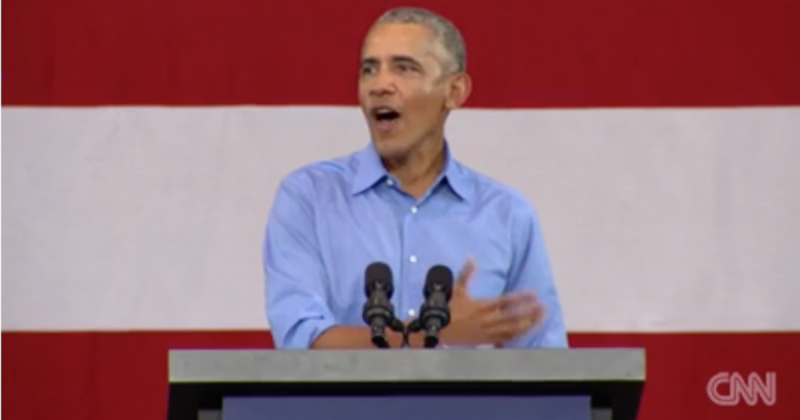 During a campaign speech in Michigan, former President Obama made a comment about civility in politics that appeared to be aimed at President Trump. At an event in Milwaukee the previous day, Obama criticized Republicans for lying about health insurance specifically regarding Americans with pre-existing conditions. Obama’s visits were to urge people to vote for Michigan and Wisconsin’s Democratic candidates. While Trump was frequently the target of his criticism, he did not spare Republicans generally and said they are lying when they say they want to protect people with pre-existing conditions while trying to repeal the Affordable Care Act. What we have not seen before in our public life is politicians just blatantly, repeatedly, baldly, shamelessly, lying. Just making stuff up,” Obama said. “Calling up, down. Calling black, white. That’s what your governor is doing with these ads, just making stuff up,” he said, referring to Wisconsin Republican Gov. Scott Walker and his assertions that he wants to protect health care for those with pre-existing conditions. Walker is being challenged by Democrat Tony Evers. Obama’s comment about lying is extremely hypocritical especially in regards to health insurance. While selling ObamaCare, Obama said Americans could keep their doctor and health insurance plans and their costs would go down. The Daily Caller reports on Obama’s claims about ObamaCare. In fact, Obama was given the Lie of the Year award from PolitiFact for his ObamaCare lie.